Bulk…What Does It Mean For Your Brand? Can your brand go bulk and benefit from the package-less trend? Nuts are a classic bulk item in many grocery stores. What other products could benefit from going bulk? At NewPoint, we’ve interviewed lots of category buyers. There’s one question we never fail to ask: What are some qualities you look for in a food manufacturer that would help you decide whether to carry their product? Over and over a common answer we hear: innovation in product, sizing and packaging. One of those innovations exploding right now is the ability to go bulk. According to a recent Food Dive report, Kroger, Giant Eagle, Wegmans, H-E-B and Hy-Vee are just a handful of the many supermarkets that are currently expanding their bulk sections. The traditional nut and candy standbys are finding themselves joined by flours, oats, and ancient grains; various rices, pastas and cereals; beans; dried fruits; teas, coffees and spices and even viscous options like nut butters, honeys, syrups, vinegars and oils. Beverages, too, are getting in on the action with some grocers offering beer or kombucha–a fermented tea–on tap. Because bigger is better, right? Well, not exactly. One reason customers flock to bulk sections isn’t for oversized portions, but for control over the size of portions. Sure some customers are looking to buy in big amounts (party time! ), but, more often than not, small amounts are what’s on the shopping list (just the right amount for this recipe I’m trying out!). 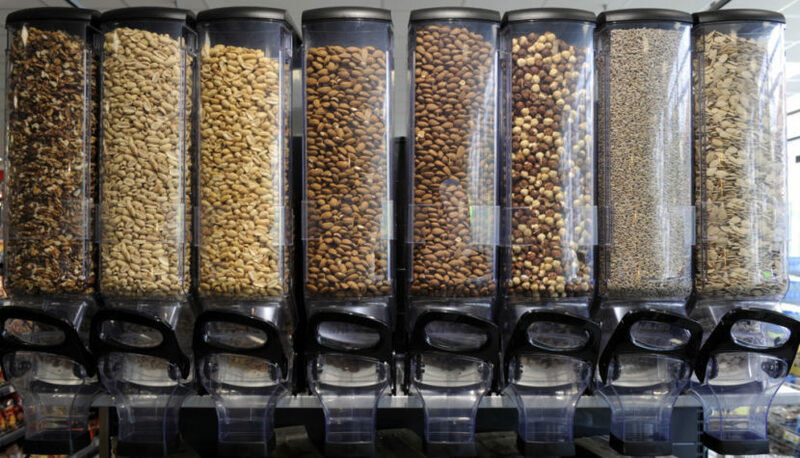 Bulk sections also give customers the freedom to make custom mixes, so they can throw together their own trail mix or spice blend. Here’s one more reason (more like an hypothesis) why bulk sections are breathing new life into the languishing dry goods/center-of-store category: in foregoing the packaging, bulk sections teach customers to associate their goods with those of the perimeter, such as the fresh produce, meat and dairy items. Documentaries like Food, Inc. and other exposés have educated customers to equate center-of-store with heavily processed (see: unhealthy) food products. In ditching the plastic, bulk sections aren’t just more eco-friendly, they also up their health appeal. Say you’re a small or regional food manufacturer who’s willing to supply in bulk. Yet you’re also worried about developing your brand. No packaging means no brand recognition, right? Your sales may go up, but you’ll never be able to develop the type of following that adds serious value to your company and opens doors for larger margins, new product lines and expanded distribution. If that’s the case, then is “bulking up” your product going to be a disservice to your brand in the long run? Not necessarily. That’s where a creative team of marketing strategists like NewPoint comes in to help you build a brand even without the public face of packaging and product labels. Progresso Soup is Making Progress…Sorta How Can Nutrition Labeling Build Brand?